Apple's Patent Win Could Alter Landscape Of Smartphone Industry : All Tech Considered The legal win over Samsung, and the more than $1 billion in damages awarded, could send rival phone makers scrambling to make their products less "Apple-like." 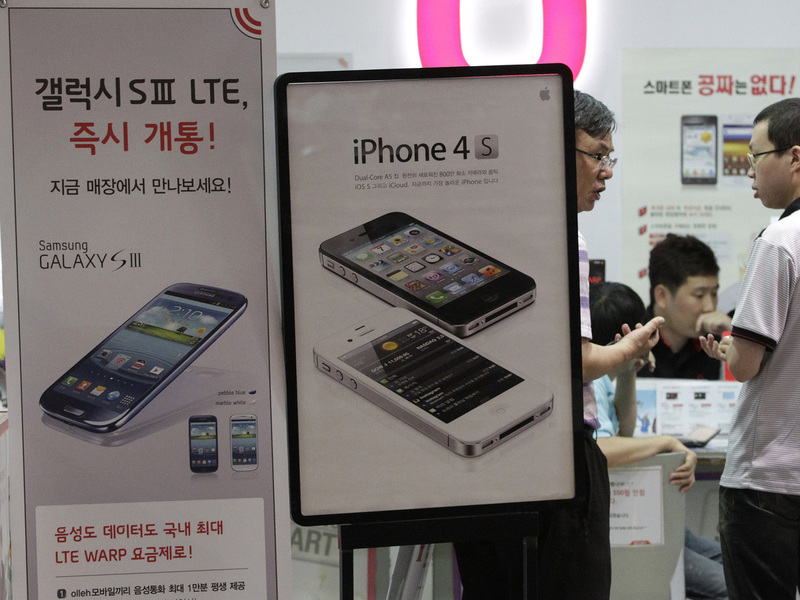 Banners advertising Samsung Electronics' Galaxy S III and Apple's iPhone 4S are displayed at a store in Seoul, South Korea. The dust has yet to settle on Apple's patent lawsuit victory Friday over electronics rival Samsung. Samsung has said it will ask the court to overturn the verdict, which would award Apple more than $1 billion in damages. But if that's unsuccessful, Samsung will likely appeal. "This decision should not be allowed to stand because it would discourage innovation and limit the rights of consumers to make choices for themselves," Samsung lead lawyer John Quinn told The Associated Press. "While this verdict applies only to Samsung, other companies have also borrowed liberally from Apple. They're now on notice that if Apple sues them, they might well lose. So they had better change their products." "This is something that everybody knows how to do now. But all of Apple's competitors have to figure out a way to let consumers do that zoom, but do it in a different way, and that's going to be disruptive to those customers." "Companies in the future are going to have to consider how much they want their product to look and feel like their competitors' products in terms of shape, size, the way it feels, the way it looks, how the icons are similar, or will the icons be quite dissimilar." Additional fallout could come in the form of what the Wall Street Journal calls the Apple tax. Competing device makers would have to license the technologies Apple sought to protect in the suit, which would add to the manufacturing cost of those products. "The verdict doesn't necessarily mean that consumers will end up shelling out more for devices from Samsung or other makers of Android devices that use similar Apple technologies. The potential extra cost could be swallowed in part by manufacturers or wireless carriers. However, [IDC analyst Al Hilwa] said that 'in the end I think the consumer will pay more.' "
"'It has got to create some concern for that ecosystem,' Baird analyst William Power said. 'The legal risks are bound to make a manufacturer think twice.' "
Aside from Apple, another big winner in the case could turn out to be Microsoft, according to Mashable's Peter Pachal. Microsoft's Windows Phone, produced by partner Nokia, has a distinctly different look and feel than the iPhone and this might be Microsoft's opportunity to gain some market share. "Windows Phone is extremely attractive, particularly now. With the launch of Windows 8, Microsoft will unite its desktop/tablet and phone operating systems with shared code. That means it's going to be incredible easy for developers to make apps that work across all Windows machines. Windows Phone also has a clear hardware leader in Nokia, so other manufacturers will never have to worry about being the only one carrying the torch. "On top of that, the OS is actually good. Windows Phones are generally well reviewed by both influencers and consumers. Criticisms generally focus on the lack of support for better hardware, but Windows Phone 8 will change that. True, its app catalog is nowhere near as robust as iOS's or Android's, but that gap could close quickly with the boost it gets from Windows 8 developers." Nokia, having been in the cellphone business for a time, also has its own portfolio of patents to protect itself. A preliminary followup hearing on injunctions based on the verdict is scheduled for Sept. 20. And considering that some of the Samsung phones that were found to infringe on Apple's patents are already on the market, The Verge says "it's possible that we could see sales bans as a result of the next hearings."